Pigs were brought to Australia with European arrivals, as a food source and have since established wild/feral populations. Their current range extends through Victoria, New South Wales, Queensland, and across northern Australia. Impact: Feral pigs damage crops and pastures, stock and property. Pigs cause infrastructure damage and compete with stock. They foul water supplies, cause erosion, and transmit diseases. They also cause environmental damage, digging up large areas of native vegetation and spreading weeds. 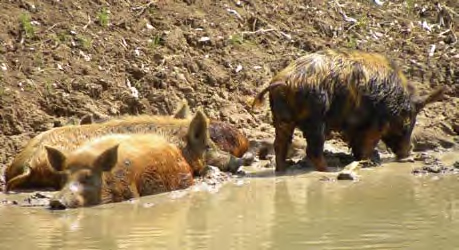 Feral pigs cause immense damage by preying on lambs. Lamb losses in areas inhabited with feral pigs commonly have lamb losses of around 15% but losses as high as 38-40% has been reported.